The juicing cleanse was once a really popular trend that I bought into. I thought (with very little knowledge about juicing), “my body 100% needs a cleanse and I can definitely go a few days without food” … until day two and half. After my second or third bottle, and a head ache that came from no food, I tossed the juice and reached for something that would restore my energy. 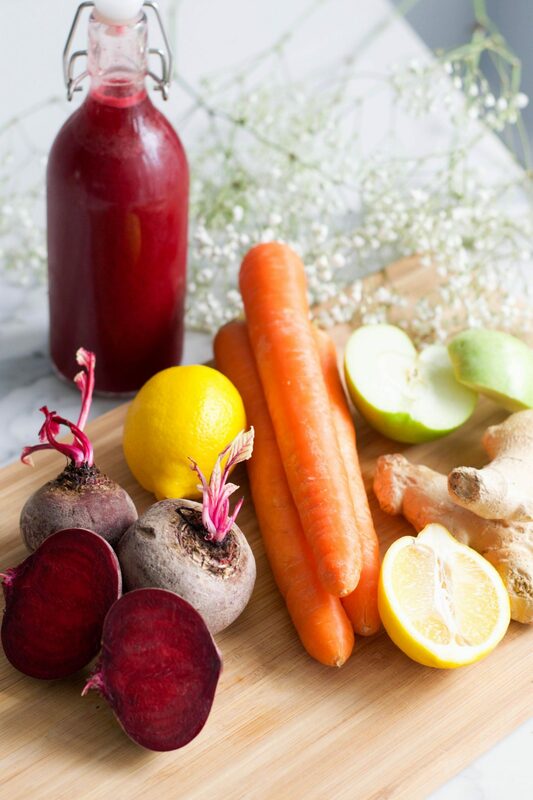 Fast forward a few years and I am now better informed and know that juice cleanses – meaning you’re only drinking juices for a few days- isn’t sustainable AND we don’t actually need juice to filter or cleanse. We have organs that do that. Today, I juice for a different reason. First, I love juices. I find that my body doesn’t love the sugar in some fruit – many of our bodies don’t – and juices are a great way of getting the nutrients I want but in a more easily digestible way. Second, I love that I can get fruits and vegetables in one cup – I don’t eat nearly enough veggies or fruits in the winter – I like to have things that are in season and berries – one of my favourite fruits- are not in season so I opt for other fruits and veggies that give me the nutrients I need. And, oddly enough, the actual process of juicing is therapeutic to me. Especially if I do it on a Saturday morning with some music on. While I love getting juices from my faves at Greenhouse Juices or Village Juicery, I love making my own juices at home. Juicing at home is one the easiest and most therapeutic things for me to do. Peeling, chopping; these things take time and force you to slow down and man does it feel good to slow down. Aside from slowing down, juicing at home has a few other benefits. This does take some time, but like I said, it saves your pocket some $$$- I can make two to three 750ml bottles for the price of one 300ml- and for me it’s very therapeutic. This juice below is my go-to’s and now one of J’s faves. Make this juice at home and add it to your diet this winter to boost your immune. It’s packed with antioxidants, vitamin A, vitamin C, potassium, iron, B6 and magnesium! I wash everything in water and vinegar before doing anything else. For those of you who may not know, vinegar is a natural disinfectant and helps clean your fruits and veggies. After thoroughly washing, I cut and peel the carrots, beets and ginger. The apples don’t need to be peeled but you can peel them if you’d like. Depending on the kind of juicer you have, you may have a little or a lot of pulp. I strain all the juices and add them to these great glass bottles I bought at Ikea. *Remember, these juices are good for 2-3 days after you make them. It’s actually been a few weeks since I’ve made myself some juice so I’m going to make some over the weekend. I might do a live or stories, so if you want to follow along, follow me here! What are some of your favourite juices? Do you juice at home? Drop me a comment and let me know.